We use only Nuetrik Connectors. All DMX series cables are quality made and tested in the U.S.A.
• Conductors: (4) 22 AWG stranded (19/34) tinned copper conductors, twisted into (2) pairs. 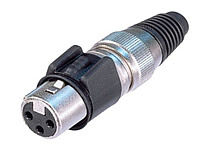 • Quality Made & Tested in the U.S.A.
Purchase here if you need Nuetrik X-HD Series Tactical Outdoor Connectors on your DMX cables. This is the Same Cable as above but there is a $14.00 upcharge on cables with these connectors. 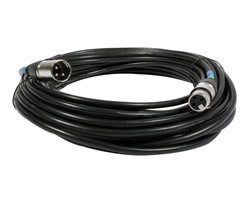 "The X-HD Series is a "Heavy duty"& XLR cable connector for outdoor use. All metal design, dust and water protected according to IP 65 by mating with related X-HD cable connector or MPR-HD chassis connector. Gold contacts are standard.